One In A Million: Images & Words ~ Farewell ~ Dear Mia and Joel. Images & Words ~ Farewell ~ Dear Mia and Joel. It is a time for sad farewells and to say hello to new beginnings in I&W. Both Joel and Mia have decided to call it quits and pursue their photographic passions elsewhere. I will take over the Helm with some new help from group members. I would like to invite all my friends on Multiply to come and join us in this creative and fun group. I will be sending you all invites soon. Thanks Dear Mia and Joel for your time and dedication to the I&W group. We have All achieved so very much. Sweet li'l chicks. They appear to want to go in separate directions. Love the words. Awww, that photo is just too cute Milli. Are they yours? Yes, it's been great times Milli, thanks for all the fun! And thanks also for your sweet words here and on PT. These little darlings Mia are very fresh. I took this photo on Sunday evening before the post. These are two of our new little baby quails. Minute actually but oh so very cute. awwwwwwwwww....they are adorable.....but then baby everythings are! I'm so happy that you are picking up the reins.....I just hope you stay on for a very long time! 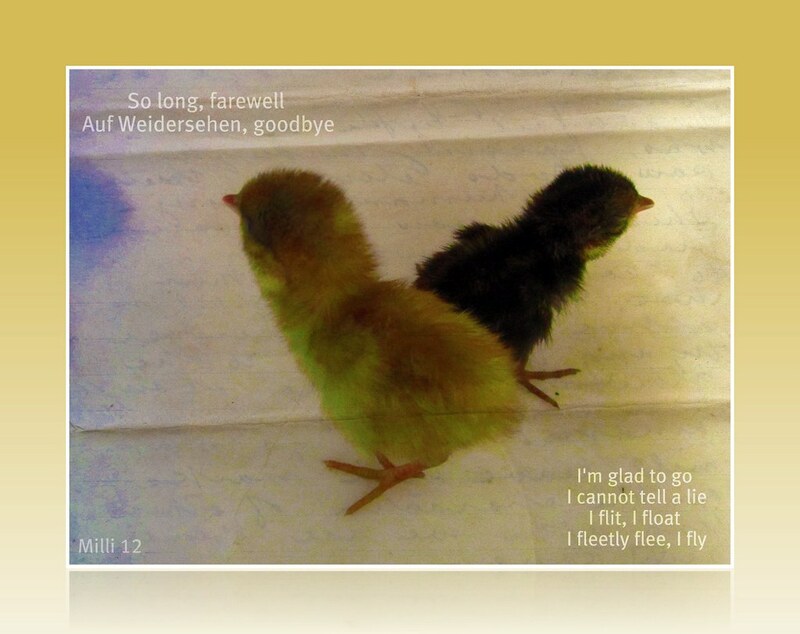 Images & Words #144 " So Long/Farewell "
oh, this is sooooo sweet! Milli those little chicks are so cute. know you will make it a very exciting and creative Group.